In the late 1990's, Spessartite Garnet was big news in the gems business. Two signficant discoveries in Africa -- first a small find in Namibia, then a larger one in Nigeria -- made high quality spessartite available to the market for the first time. What had once been a scarce collector's stone became known to the retail jewelry market, and designers and consumers were excited by the fiery orange gem. But the excitement died down in just a few years when the mines were quickly worked out. Though some new material was found in Namibia and Mozambique, the quality was not there -- the new material was marred by bubble inclusions and simply didn't have the fire and brilliance that had initially excited the market. While it's natural that the jewelry market would lose its enthusiasm for a gem that was no longer available, most gem buyers don't realize that there is still some fine Nigerian spessartite available from specialized gem dealers. We made a significant investment in Nigerian spessartite during the short period when it was relatively plentiful, and we've been cutting the material over the years. You'll find that we still have a very good selection of high quality pieces, from 1 to 11 carats. Colors range from pure mandarin orange to bright yellowish-orange to golden-orange and reddish orange. Ovals are the most common shape, but we also have a quite a few cushions, trillions, rounds and pears. We also have a number of matched pairs and even several elaborate layouts for suites of necklaces and earrings. For jewelry lovers, high quality Nigerian spessartite combines vivid color with exceptional brilliance. For gem collectors, there is still an opportunity to acquire these rare and valuable gems before they disappear entirely from the market. This month we feature fine Garnets from our collection, from Spessartite to Rhodolite, Tsavorite and more. Click on a photo to see the details for the item. A splendid large purplish-red rhodolite in an elegant cushion. This is clean material with excellent transparency and fire and will set up beautifully in your jewelry design. Guaranteed natural and untreated. A top grade tsavorite in a rich velvety chrome green. Beautifully fashioned to display full brilliance and fire. This is very fine crystal (graded "almost loupe clean") and is a very bright and lively gem. Guaranteed natural and untreated. Mali garnet is a mixture of grossularite and andradite garnets, and is a fairly recent find, discovered only in 1994 in Mali, West Africa. This fine specimen has an attractive greenish-gold color with outstanding fire. Guaranteed natural and untreated. Malaia Garnet is a rare hybrid that is a mixture of pyrope, almandine and spessartite. The Malaia color is typically reddish-orange or orangey-red. A pink hue is unusual, and makes this large 7.83 ct specimen particularly rare. This fine gem has a padparadscha-like hue with wonderful fire. This is an outstanding piece for the garnet collector. Guaranteed natural and untreated. A beautiful example of the color change garnet from Kenya. This fine trillion displays a dark bluish green with a deep purple flashes in cool daylight and shows strong change to deep purplish red under incandescent light. Guaranteed natural and untreated. An exquisite large Mandarin Garnet in a wonderful intense orange. This excellent material was precision cut and both the polish and shape are excellent. This fine Spessartite simply bursts with color from all angles. Guaranteed natural and untreated. Queen Elizabeth II of the United Kingdom celebrated her Sapphire Jubilee -- 65 years on the throne -- last month. 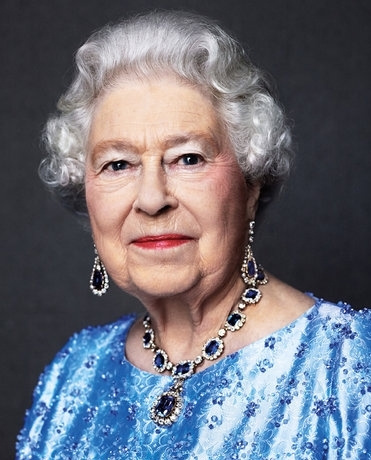 As part of the commemoration, the palace published a 2014 portrait of the Queen by the photographer David Bailey, showing the Queen wearing a sapphire necklace and earrings given to her by her father, King George VI, as a wedding gift in 1947. The suite was originally made in 1850 and was purchased from Carrington & Co. It features large emerald-cut sapphires surrounded by diamonds in both the necklace and earrings. As given to the Queen, the necklace had 18 sapphire clusters; she had it shortened by four links in 1952. In 1959 the largest cluster was turned into a pendant to hang from the necklace. In 1963, the Queen added a tiara and a bracelet, making the suite a true parure. A research team, led by South Africa's University of the Witwatersrand, has found pieces of an ancient continent under the island of Mauritius in the Indian Ocean. According to the report published in the journal Nature Communications, the piece of crust is left over from the breakup of Gondwanaland, a super-continent that existed more than 200 million years ago. Containing rocks up to 3.6 billion years old, Gondawanaland split into what now are Africa, South America, Antarctica, India and Australia. The team made the discovery by analyzing a mineral -- zircon -- found in rocks spewed up by lava during volcanic eruptions. They said that remnants of the mineral were much too old to belong to Mauritius. "Mauritius is an island, and there is no rock older than 9 million years old on the island," says Lewis Ashwal, lead author of the paper. But by studying rocks on the ocean floor, they found zircons that were 3 billion years old. Geologists are particularly interested in zircon because it is the oldest mineral on earth, with specimens from Australia dated at 4.4 billion years old. Considering that the earth formed 4.56 billion years ago, the oldest zircons in represent the earliest record of the earliest crust of the earth. Each month we answer questions from our customers. We welcome your questions and you can submit a question from our contact page. Of all the hard transparent gems faceted for jewelry, zircon is about the densest material. It has a density rating of 4.73, compared to 4.05 for sapphire, 3.53 for diamond and 2.65 for amethyst. For the gemstone buyer, the main consideration is size vs. weight -- a 1 carat zircon will be noticeably smaller than a 1 carat diamond. So it's essential to check the dimensions as well as the carat weight when buying zircon. Finding a gemstone to fit exactly into an existing ring setting is always a challenge, and the size requirement may severely limit your options when searching for an appropriate stone. But when you have a ring with such sentimental value, there are ways to preserve the ring without limiting your gemstone choices. A good jeweler can replace the prongs or the head in the ring to accomodate the gemstone of your choice.